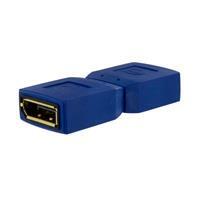 This DisplayPort gender changer offers two female DisplayPort connectors - a simple, cost-effective solution for joining two short DisplayPort cables to create a longer, single cable. The gender changer is durably constructed with gold-plated connectors and a latching design to prevent slippage. Backed by Lifetime Warranty.